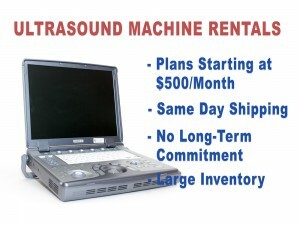 We’ve just increased our rental ultrasound machine inventory to more than $1.7 million! There’s never been a better time for you to expand your ultrasound offerings. With our inexpensive, fast and friendly ultrasound rental program, you can quickly increase your business revenue and patient satisfaction rate by adding a high-quality portable ultrasound machine to your business. Most recently, we just added 12 late-model GE Logiq e ultrasound machines to our inventory, and you can get them NOW at a great price. We’re confident that we have the system to fit your needs, we have inventory for every modality and plenty of transducers. One conversation with our expert sales staff, and we’ll set you up with the best ultrasound machine for your needs. Do you have a short-term ultrasound need? Call us today at 877-661-9911 today to get a free quote on a rental ultrasound machine.